This is going to look like a plug for QANTAS. Consciously not so, although I do admit enjoying boarding a QANTAS flight at a foreign destination after being away from home for a few weeks and hearing the flight attendants and their accents from home and seeing their relaxed way of going about things. 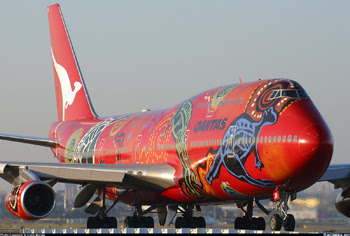 And I also have to admit to a twinge of pride when pedestrian traffic jammed up Frankfurt Airport as everyone pressed to catch a glimpse of Wunala Dreaming, the QANTAS aircraft seen here in this photo (by Craig Murray). I had just disembarked and wondered what all the fuss was so followed the crowd to see. On a glum, wet and overcast autumn day in Germany this plane brightened things up. And if I recall correctly it was the first time the aircraft had landed in Frankfurt. Sometime in 1995. But QANTAS had prompted this blog for another reason altogether. As you may have gathered I have a fascination for Google Earth. All that Air Force photo imagery work is still in the blood I guess. And what QANTAS has done here with Google Earth, admittedly in a neat bit of self promotion is a sign of things to come with Google Earth. Take a tour with Qantas around the world. I thought it was pretty neat.